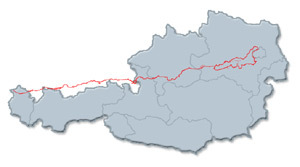 Coming up with a simple explanation for my route through the eastern half of Austria is not easy. Firstly I have to explain that there are two E4 options through Austria, one which takes you along the Nordalpenweg 01 and one which takes you along the NordAlpenweg 04. Secondly the route I took combined bits of both options - I took the 04 for the first six days after Salzburg and then switched south to the 01. Thirdly I have to explain that my last two days in Austria were on an option which I made up myself designed to avoid what I considered to be an unnecessary diversion which goes north and then south again before joining up with the E4 through Hungary. Of course I was trying to save time. I had been walking for five months and was keen to get to Budapest and home to London. The bad weather through Bavaria had taken its toll on my morale and the forcast was for more rain. More important neither of the official E4 options seemed to make sense to me. Both routes struggle to join up with the start of the Hungarian section in a direct way. The northern variant takes you to Vienna and then south while the southern variant takes you east, close to the Hungarian border, but then heads north to Neusiedler See, before retracing its route south. The truth of the matter is that the international long distance routes don't always make sense. They are superimposed on national routes which vary in complexity and develop over time. 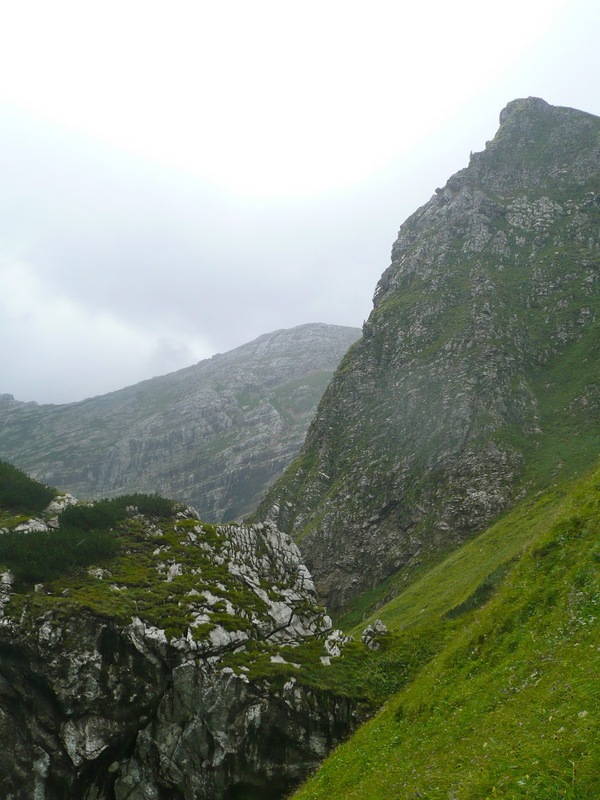 Given the huge potential for beautiful walking, the route is particularly complicated in Austria. Not only are there two basic variants (one following 01 and other the 04) but there are variants within variants (with the 01 splitting in eastern Austria with one leg going to Vienna and the other to Rust). Because the routes are superimposed on national routes extensions to the international network are not always straightforward. There was clearly a problem knitting the Austrian ends of the E4 up with the start of the Hungarian section which was added later. The original E4 ended in Austria to the north of the start of the "Blue Route", the national trail followed by the E4 in Hungary, and this presumably explains why you have to go north to Neusiedler See (the original route) and then south again to start the Hungarian section. I guess it's just not worth redesigning the route and taking down all the old signs and putting up new ones given the limited number of longdistance walkers. So my route through eastern Austria is the "John Hayes E4 Variant". It travels along the Nordalpenweg 04 for six days, crosses to the 01 and then avoids the return trip to Neusiedler See by taking a more direct route to the Hungarian border. What's more it nearly works although, as I'll describe, things do fall apart a bit just before arriving in what proved to be a Hungarian navigational safe zone. Despite my declining enthusiasm things actually picked up once I got into Austria. The weather continued to be mixed but the walking was excellent. More of the accommodation was in mountain refuges and from Salzburg, until I left the Alps I had my wife Christine as company. 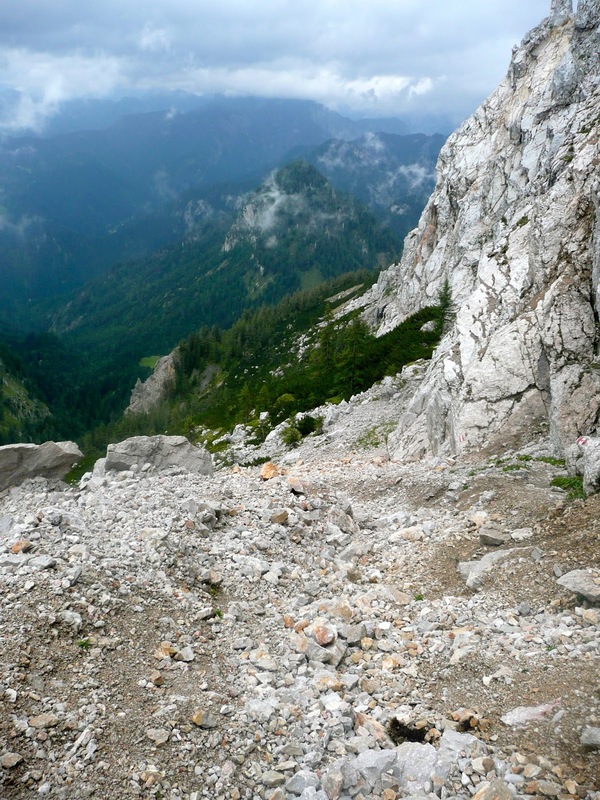 Although not quite as super-efficient as Switzerland, Austria is a walking friendly country. The waymarking is better than Bavaria and the network of mountain huts makes accommodation easy to find. Climbing and skiing are the key national sports in Austria and walking of course is a close cousin. Austrians watch the weather forecast and as soon as the sun comes out the mountains fill with walkers heading up to a hut, a beer, sausage and the other defining Austrian habit - music. Every hut has a harmonium and there are lots of walkers only too keen to demonstrate their talents. You could do a lot worse than walk from Salzburg to Vienna - both really interesting places. Salzburg of course is the birth place of Mozart, the location for the filming of the Sound of Music and famous for its baroque architecture. Vienna, on the other hand, has a fascinating imperial legacy. Austria, which after all is quite a small country, has a capital which a hundred years ago was the centre of a huge and complex empire. The empire has gone (almost overnight) but the imperial architecture remains. As it happens I had been before to both Salzburg and Vienna and for me city breaks are one thing, walking into a city another. Staying for a short time in a city centre you see its best bits, walking into a city centre you see its worst. If I have to travel through endless suburbs I think it's better by bus. In any event I wasn't going to Vienna and in the end only stayed in Salzburg one night. 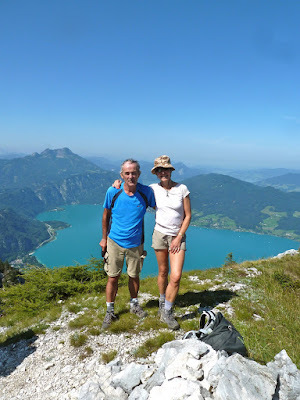 The first chunk of walking however, through the Salzkammergut, was a highlight in its own right. The area often referred to as the Austrian Lake District is a world heritage site, and has a reputation for some of the best walking in Austria. It has its own Cicerone Guide "Walking in the Salzkammergut" by Fleur and Colin Speakman and offers truly varied walking from tough Alpine hikes to lakeside strolls. Perhaps not as famous as the Salzkammergut, the last alpine part of the walk after the switch to the Nordaplenweg 01still had some special places to visit. 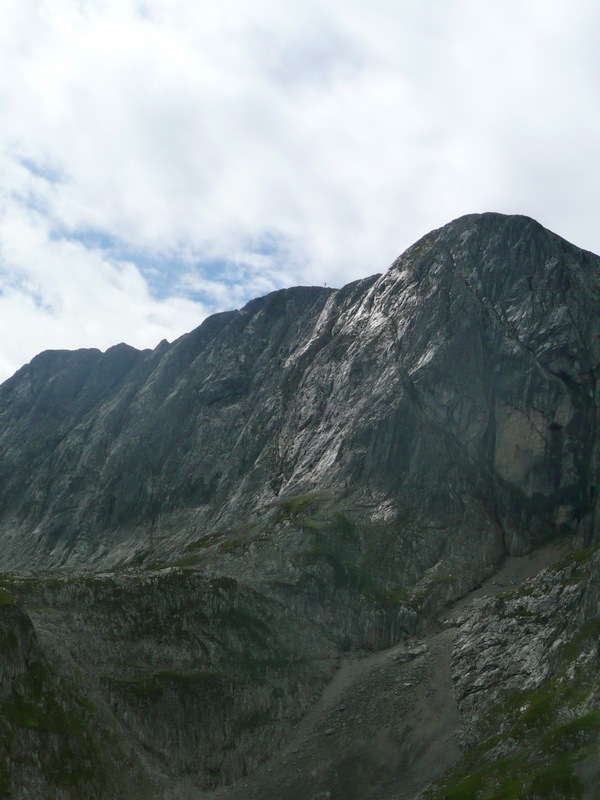 It includes the Gesause National Park, the Hochshwab, and what turned out to be an amazing finale, the Murztaler Alps. Christine had booked the accommodation and had found a hotel really close to the point at which the E4 left Salzburg, essential if you don't want to go site-see in Salzburg. The first target is Gaisburg, a 1000 metre climb with views back over the City. It's then a pleasant walk down to Ebanau with a fairly flat (dull) walk to Faistenau. Lots of places to stay at Faistenau. The walk next day was huge, taking you into the heart of the Salzkammergut, down to the first big lake (the Fuschlsee) then along to St Gilgen and views of the second big lake (the Wolfgangsee) finishing with an enormous 1400 metre climb up to the Schafberg. The Schafberg is an amazing place, another mountain top with its own train station. The food in the hotel was very average but the location more than made up for it. When I was there it was empty but on really sunny days I suspect it gets very busy, the views are just vast. The descent from the Schafberg requires a serious head for heights but the scenery was brilliantly set off, when we were there, by wonderful weather. We found the perfect mid morning coffee stop at Eisenauralm although by 10.30 most of the locals were drinking beer. The long walk down to the Attersee starts to get a bit tedious before you get to the end but, once you have walked around the lake, Weisenbach is a pretty little village. There are lots of Weisenbachs in Austria and we had booked a hotel in the wrong one but luckily found a guest house which was more than adequate. Enjoyed a swim in the lake before dinner. The walk next day was epic, maybe just a little too epic. The weather started really well and after an easy walk the day before the 1200 metre climb up to Brennerin (1602 metres) was good with stunning views back to Attersee. After the big climb the trail undulates along a dry scrubby limestone trail to the Hochleckenhaus, a very popular hut when we were there and a good place to stop for lunch. 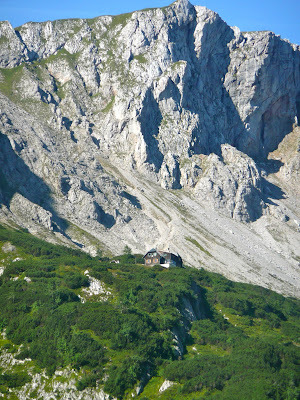 Trouble is it's still a long way to the Reider Hutte, and in the way is another climb up to the Grunalmkogel (1821). 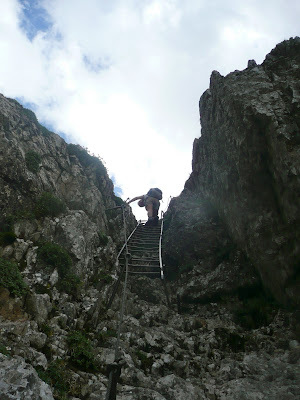 The climb down is really tough and includes a fairly hairy bit of walking along a very narrow path. Eventually things got easier but the remote and tiny Reider Hutte was a very welcome site. After Reider Hutte it's more fairly flat walking across the limestone massif it's a big descent on a fairly dull trail through ski run scarred mountainside down to Ebensee. On a good day the views would have been huge but the rain had returned when we were there and we saw very little until we got to the bottom. We stayed at the Hotel Post which was excellent. Not so much climbing next day and most of the walk was in trees but a very nice walk none the less. Stopped for lunch at the lovely lake at Offensee where Christine went for a swim. With hindsight continuing south from here and joining the 01, which gets very close, would have made sense but we stayed on the 04.. Almsee, the next lake, is in another stunning location and we found a brilliant hotel (just a bit expensive) at Habernau where we enjoyed the best food we had had in Austria. The next day was the last one in the Salzkammergut and although the scenery is nice, it's not as dramatic as it has been. The route takes you along a valley to the Almtaler Haus (a cheaper alternative to the Hotel in Habernua), up over a relatively small ridge at Rind, and then along another valley down to Steyrling. We then carried on along the valley to the train station, caught the train south and stopping at Spital am Pyhrn to start the second half of the Austrian walk along the 01. There was lots of cheap accommodation at Spital am Pyhrn although our arrival there signalled the start of a spell of really bad weather. We did manage to make the climb out of the village and up over the pass at Pyhrgasgatteri (1350 metres) but then it really started to rain. The first half of the walk is excellent but the second half, through semi-suburban countryside to Admont, was not very nice. Admont itself, home to a large baroque monastery, looked interesting and we found cheap little gasthof near the town centre to dry up in. The weather was very bad the next day and we hadn't been able to find a local map and the guidebook (which anyway was in German) was very basic. We got lost several times, very frustrating in the rain, and definitely added a lot of time to the walk. We were on track again when we got to the Oberst Kinkler Hutte (no food on a Monday) and found the pass at Kalblinggateri but rain meant we missed the views as we entered the Gesause National Park. Had originally hoped to stop at Johnsbach, and on a good day could have made it easily, but instead stayed and dried out at the lovely Modlingerhutte and pigged out on beer and strudel. The next day's walk, to Hess Hutte was a good one with great views of Hochtor (2369 metres), the highest mountain in the Ennstal Alps. It involved a steady 1,000 metre drop down to Johnsbach (stopped for coffee at the Hotel where we should have stayed and it looked good), a walk along the valley followed by a really good 900 metre walk up to the Hesse Hutte, another hut in a stunning location. Next day should have been a good one but dodgy weather and rain soaked ground make it difficult. It was blowing a gale up the valley as we left the Hess Hutte and the wind didn't drop until we had climbed the pass at Sulzkarhund (1815 metres) and got into the lovely sheltered valley of Sulzkaralm which was full of wildlife. The route then takes you down a long way before a gradual climb through trees and meadows until you find yourself under the huge cliffs of the Lugauer (2207 metres) The route down is very difficult, steep with unstable scree. It was nerve racking and a real relief to get onto something more solid at bottom. We stayed in a basic but friendly gasthof right in the middle of the village of Radmer. Good weather the next day and a pleasant walk. 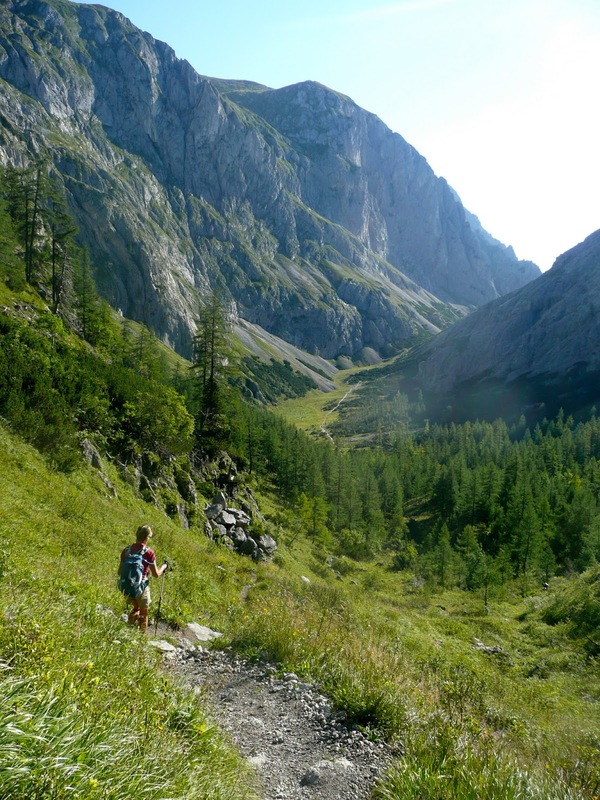 A simple 600 metre climb along a forest trail to the pass at Radmer Hals and then a walk along a beautiful valley followed by a long contour trail leading down to the town of Eisenerz. On the final descent you're treated to views of what is claimed to be Europe's oldest working iron ore quarry although, after centuries of years of operation, activity now seems to have finished. The next day's walk up to the Sonnschien Hutte was excellent. Once you get out of Eisenerz, you climb up the side of a valley and then turn east into a long gorge with the River Hintersee Graben running along the bottom. At the end of a lovely walk the route takes up steeply until after around 1,000 metres your in an upland valley with good views all around. Staying high you eventually reach the Sonnschien Hutte which, despite being a Saturday, was empty enough for us to get our own room. The bad weather returned in time for the climb up to the Hochschwab, really bad with lots of people, including us, getting confused at the top in the wind, rain and very low cloud. We managed to miss the right route to the summit only to find another one, go over the top and then return back to where we had started. Eventually the cloud lifted, everything became clear, and we walked down a deep valley with huge cliffs to the east of the Hochschwab. We stayed the night in a crowded Voisthaler Hutte but only had to share our room with a couple of other people who were very quiet. The walk down the deep valley continued the next day but this time in brilliant sunshine. The good weather bought out the Austrian walkers in large numbers (you can walk to the top of Hochschwab and get to and from Vienna in a day). At the bottom of the valley is the village of Seewiesen and after crossing the road it's a gentle climb up through wooded countryside and pastures past huts at Seebergalm, Gorrecheralm, and Turnaueralm before a final tough climb up to Graf Meran Haus. 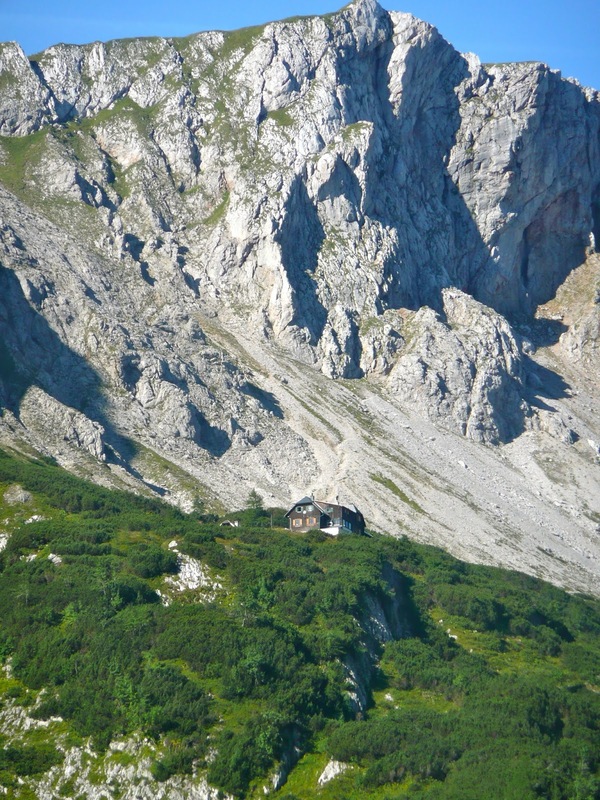 This hut, currently very primitive but apparently about to be done up, has a brilliant location just under the summit of the Hohe Veitsch. Another great evening with several harmonia players in attendance. 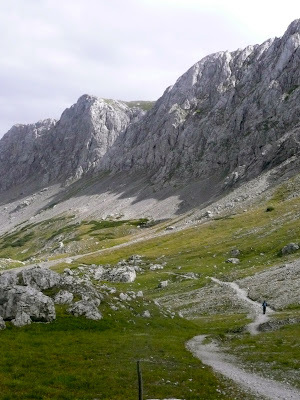 The initial part of the walk next day was lovely, high up in classic limestone surroundings and across open pasture, but dropping down a bit the scenery became more wooded with the views limited and fairly boring. My target was Krampen but when we got there the gasthof I was hoping for didn't exist and after a series of huts with limited washing facilities we were desperate for a shower. 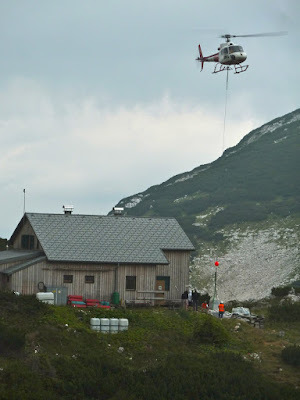 It would have been feasible, with a bit of push, to reach the next hut (quite a big climb up to the Wiener Leher Hutte) but instead we decided to stay in Neuberg. Next day, instead of retracing our steps to Krampen, we took a more direct route up through the trees on the lovely open plateau above Neuberg and stopped for an early lunch at the Schneealpen Huas which sits in splendid isolation in the middle of an upland plain. A brilliant stretch of walking then takes you across this plateau, past the Lurgbauer Hutte, down steeply into a valley and then up again past the abandoned Zimmermann Hutte. The next bit was perhaps the most exciting bit of the whole of the E4, better even than the climb up to Canigou. Ropes, ladders, scree everything was thrown at us for the next 45 minutes or so but for some reason, on this day, it was just on the right side of the exciting/scary pivot point and the higher we got the more confident we felt. There was a real sense of achievement when we got to the top and as we made our way across another plain to the modern a very comfortable Karl Ludwig Haus. The Nordaplenweg 01 splits just after the Karl Ludwig Haus with the main route carrying onto Vienna and a southern variant carrying onto towards Rust. We took the southern variant and headed towards Semmering. Dropping down from the Predigtsuhl and eventually past the Wax Reigel Haus, the route takes you into trees and along a ridge walk. Christine was returning to England and you can get a train from Semmering but stopping there means leaving the route and if you're carrying on a better place to stay would be Maria Schutz which is another hour or so along the route. One of the things I tried but failed to buy in Semmering was a local map with the walking routes marked up. They just didn't exist. 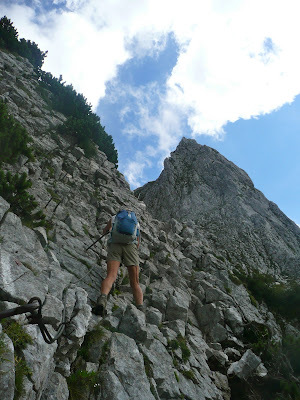 My plan involved walking to Bromberg the next day and then onto Marzakogel where I would join the 07 longdistance trail heading south which, as I understand it, is the official return route from the Neusiedler See. Trouble was I was entering a less fashionable walking area and waymarks and maps are hard to find. I did make it to Bromberg - a pleasant walk, no longer alpine and through countryside full of cattle and prosperous looking villages - but although I knew I was heading in the right direction I was never sure of the trail. The gasthof I wanted to stay at in Bromberg was shut (another feature of the less fashionable places is that accommodation is often shut for the holiday month of August) and I had to stay at some distance from the village and definitely off the trail. Next day with Marzakogel as my target I got completely lost and although I was hitting some of the right places I couldn't find the trail and accommodation was also proving difficult to find. I needed to get to a place along the 07 called Landsee and from there you're supposed to head east and cross the border, join the Blue Route and then head to Kozeg. I couldn't find the route and I couldn't find anywhere to stay so in the end, after consulting helpful people in town halls, made it to Markt St Martin, not on the 07 but not far from the border. The last day, from Markt St Martin to Kozeg in Hungary I walked on roads all the way. I was definitely not on the E4 but finding it without a map, and with few waymarks, felt like a real wild goose chase. The last few days in Austria were a bit of an anticlimax to what otherwise, despite mixed weather, had been a wonderful walk.